What's on the Mind of the Woodworker? Cooking! Kalamazoo Grills have served these sliders to happy crowds all over the country, especially in burger-crazy Los Angeles. They are so well-received they have become our go-to protein at just about every grill demonstration and customer party. We figured it’s about time to share the recipe with all of you. 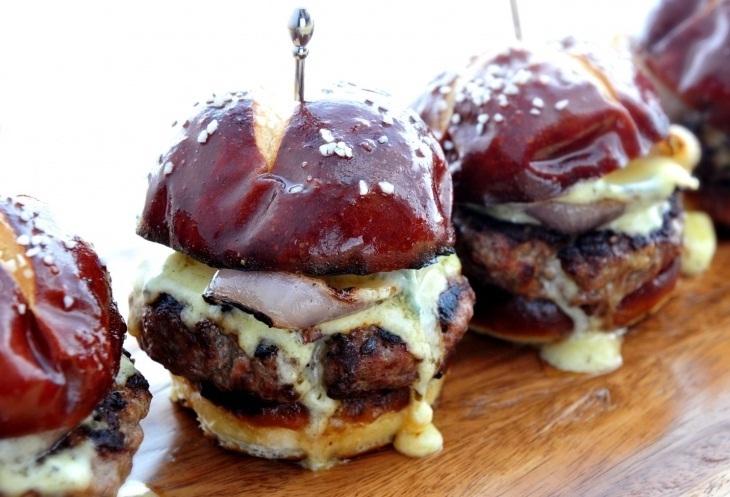 The secret weapon in our burgers is a triple cream blue brie from Germany called Cambozola. Of course, all of our top burger tips still apply. Why do we do “sliders” instead of “burgers?” I think the perfect burger requires a rather specific thickness. On a full-sized bun, it requires about a half-pound patty, but on a slider bun, it only requires a quarter-pound patty – a much more reasonably-sized indulgence!